Lenore is back in Volume 2, # 8, which is the first in a new four-part story that eventually leads to the demise of one of the main characters….but who? The comic starts with a little insight into the history of Taxidermy, otherwise known as Taxen-Ra, the original guardian of the children and what turned him into the killing machine we know and love today. 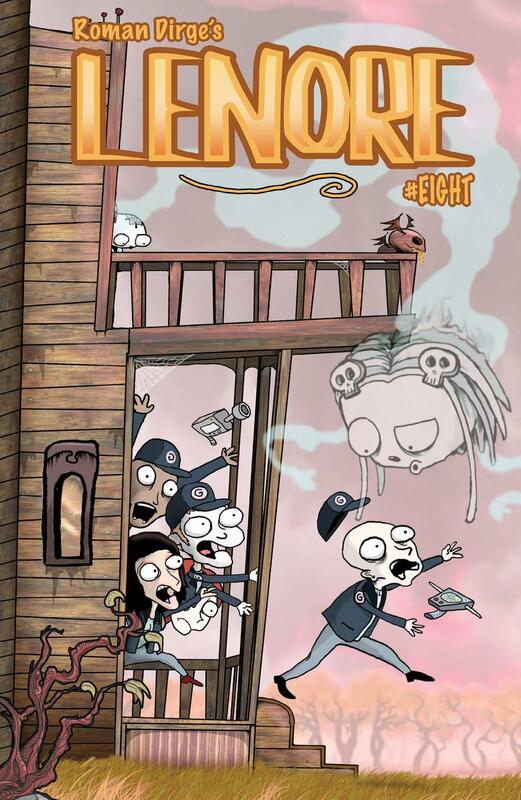 Chuck in a little bit of mass murder, an alternate reality, a skin suit, live broadcasting and brain eating and there you have it, Lenore Volume 2 #8. Roman Dirge has been one of my favourite comic book creators since I discovered his work about 10 years ago. His sick, twisted, yet truly imaginative storylines never fail to amuse and captivate. His characters are the definition of weird and wonderful, both visually and in personality. This latest offering from the Lenore series is no different and both unnerves and delights. Now I’m just left dying for the next three parts of this story!